Our Unix Tests allow you to experience an online examination in the real-time environment. In every online test on Unix, you will be presented with Multiple Choice Questions (MCQs) which will test your skills in Unix Concepts in a detailed and comprehensive manner. In the test, each question will have 4 options to choose from. You should select only 1 correct option as an answer and then move on to the next question. Once you submit answers to all the questions, you will be given your final test score. In the Online Unix Test, for every correct answer, you will be given 2 points. There will also be negative marking of -1 for every wrong answer. So, you will have to be more careful in choosing the answers to the question in your online examination. If needed, you should skip to the next question and come back to the previous question later so that you can do proper time management for the online mock tests. 1. "Unix Practice Tests" - In Unix practice tests, there will be a series of practice tests wherein you can test your Unix concepts on every chapter separately. There will not be any time limit on these tests. So, Unix Practice Tests should be the first set of tests which you should attempt. Goto these practice tests here. 2. "Unix Mock Tests" - In Unix mock tests, there will be a series of mock tests wherein you can test your Unix concepts on every chapter separately, but there will be a fixed time limit per test. So, it is similar to Unix Practice Tests, but with an added constraint of time limits. 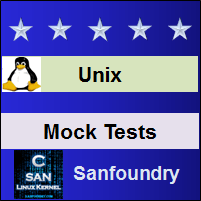 You should try Unix Mock Tests if you are appearing for any online examination soon. Goto these mock tests here. 3. 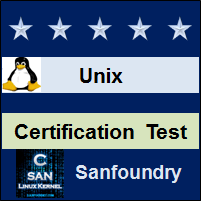 "Unix Certification Test" - Once you are through with your Unix concepts, then you should try our Unix Certification Test wherein Sanfoundry will issue a free Certificate to you if you scored either Grade A* or Grade A in Unix Certification Test. Goto Unix Certification test here. 4. "Unix Internship Test" - If you are interested to do Internships in Unix at Sanfoundry, then you must take our Unix Internship Test. If you scored either Grade A* or Grade A in Unix Internship Test, then you are eligible for Internship at Sanfoundry in Unix. Goto Unix Internship test here. 5. 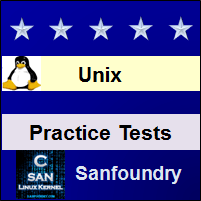 "Unix Job Test" - If you are a fresher, a dropout, an experienced person and if you know Unix well and looking out for jobs in Unix domain at Sanfoundry (or our Network of Companies), then you should try and qualify our "Unix Job Test". 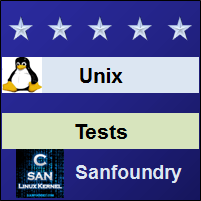 If you scored either Grade A* or Grade A in Unix Job Test, then you are eligible for a Job at Sanfoundry (or our Network) in Unix domain. Goto Unix Job test here. For every "Unix Practice Test", Total Questions: 20, Total Time: Unlimited. For every "Unix Mock Test", Total Questions: 20, Total Time: 20 Minutes. For "Unix Certification Test", Total Questions: 50, Total Time: 1 hour. For "Unix Internship Test", Total Questions: 50, Total Time: 1 hour. For "Unix Job Test", Total Questions: 50, Total Time: 1 hour. Before you get started on these series of online tests on Unix, you should learn, study and practice our collection of 1000 MCQs (Multiple Choice Questions and Answers) on Unix here. We also prefer that you should practice Unix practice tests and mock tests completely before attempting the certification test. Here is the list of online practice tests and mock tests on Unix. Each online test focuses on a "Specific chapter of Unix". So, you should try both practice test and mock test on every chapter to do a self-assessment of your knowledge (along with time-limit constraints) in every area or sub-topic of Unix. Unix Certification test, Internship test, and Job Test are mentioned at the end of this list. 1. Unix Test 1 – This set of online test on “Unix” tests your skills on Introduction to UNIX, Commands, General Purpose Commands – 1, General Purpose Commands – 2, Categories of Files, File Handling Commands: pwd, cd, Absolute and Relative Pathnames, Listing Directory Contents: Is Command. 2. Unix Test 2 – This set of online test on “Unix” tests your skills on Displaying and Creating Files: cat Command, Copying a File: cp Command, Deleting and Renaming files: rm and mv Command, Comparing Files:comm, cmp and diff Command, Counting File Data: wc Command, Compressing and Archiving Files – 1, Compressing and Archiving Files – 2, Listing File and Directory Attributes. 3. Unix Test 3 – This set of online test on “Unix” tests your skills on File Ownership and Permissions, Changing File Ownership and Permissions – 1, Changing File Ownership and Permissions – 2, Vi Basics and Modes – 1, Vi Basics and Modes – 2, Vi-Input Mode, Vi-Ex Mode – 1, Vi-Ex Mode – 2. 4. Unix Test 4 – This set of online test on “Unix” tests your skills on Navigation in Vi Editor – 1, Navigation in Vi Editor – 2, Editing Text in Vi Editor – 1, Editing Text in Vi Editor – 2, Commands for Searching, Replacing and Substituting in Vi Editor, Shell Basics, Pattern Matching, Escaping and Quoting – 1, Pattern Matching, Escaping and Quoting – 2, Redirection and Pipes – 1. 5. Unix Test 5 – This set of online test on “Unix” tests your skills on Redirection and Pipes – 2, Command Substitution and Shell Variables, Process Basics, Process Status:ps Command and Phases of a Process, Process Handling Commands – 1, Process Handling Commands – 2, Process Management – 1, Process Management – 2. 6. Unix Test 6 – This set of online test on “Unix” tests your skills on Shell Variables – 1, Shell Variables – 2, Shell Offerings, Advanced File Handling Commands, Locating Files: find Command, Filtering Commands – 1, Filtering Commands – 2. 7. Unix Test 7 – This set of online test on “Unix” tests your skills on Sort Command, Unique and tr Command, grep command – 1, grep command – 2, sed command – 1, sed command – 2, Shell Programming using read Command and Command Line Arguments, Logical Operators and Conditional Execution, Using test and [ ] to Evaluate Expressions – 1. 8. Unix Test 8 – This set of online test on “Unix” tests your skills on Using test and [ ] to Evaluate Expressions – 2, Case and Expr Command, Shell Programming using Various Commands – 1, Shell Programming using Various Commands – 2, Administrator Specific Commands and Privileges – 1, Administrator Specific Commands and Privileges – 2, Administrator Specific Commands and Privileges – 3. 9. Unix Test 9 – This set of online test on “Unix” tests your skills on Various Operations using Awk Command – 1, Various Operations using Awk Command – 2, Various Operations using Awk Command – 3, perl – A General Purpose Tool – 1, perl – A General Purpose Tool – 2, Operator-Command Combinations, Handling Multiple Files and Buffers. 10. Unix Test 10 – This set of online test on “Unix” tests your skills on Customizing Vi Editor, System Calls Basics – 1, System Calls Basics – 2, File handling System Calls – 1, File Handling System Calls – 2, Process Control Basics, Process Control System Calls – 1, Process Control System Calls – 2, Performance Components and Tools. 11. Unix Certification Test - This set of online free certification test on "Unix" tests your skills on all areas (all chapters, topics and subtopics) of Unix. 12. 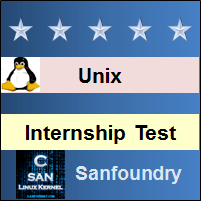 Unix Internship Test - If you scored either Grade A* or Grade A in our Unix Internship Test, then you can apply for Internship at Sanfoundry in Unix. 13. 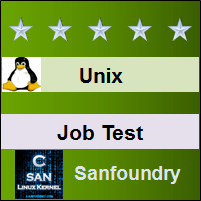 Unix Job Test - If you scored either Grade A* or Grade A in our Unix Job Test, then you can apply for Jobs at Sanfoundry in Unix domain. Best Wishes for your Unix Tests!